Babies will literally spend an entire day crying, pooping and eating. This is a simple fact every parent knows, but in order for them to grow strong, the fact of the matter is they have to eat. Once they pass that stage and enter the wonderful world of solid foods you’ll need to get them their own set of spoons. Buying a set of spoons for your child can feel like a headache, there’s simply too much out there that hasn’t been properly vetted, so we went ahead and took care of that part for you! This is a detailed guide on what to look for in the best spoons for your baby. Have you ever wondered why they even make baby spoons in the first place? Well when you’re moving a baby up to solid foods, if you use a teaspoon it can actually cause problems for you both later on. The teaspoon much is too deep, and they’re generally made of metal anyhow (which is a bad thing for babies). What type of baby spoon are you looking for? Depending on the age, the best spoon for your baby could be either a beginner spoon, an intermediate spoon or a self-feeding spoon. With a beginner style, you’ll see they’re generally more flat than curved, but the baby could have more luck pursing their lips over the spoon. An intermediate spoon has a slightly larger bowl on the end designed to help your baby learn how to actually use the utensil themselves. They also learn how to close their mouths over the spoons themselves. 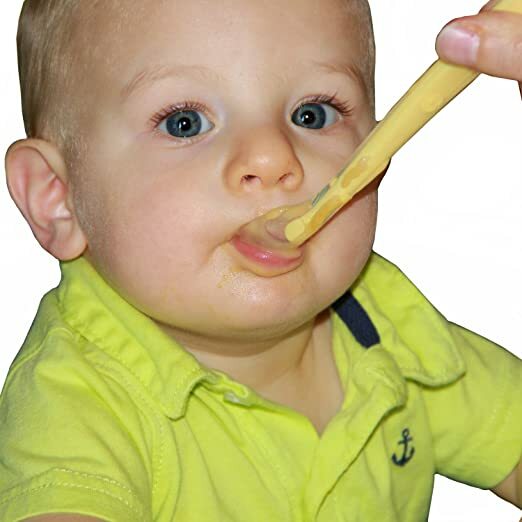 Self-feeding spoons tend to be shorter and more curved with a thicker handle to allow your child more ease of use. No one wants something bad to happen to their child, so keeping an eye out for harmful materials is a top priority. If you don’t see anything on the packaging about the spoons being BPA-free… steer clear; the FDA banned its use in bottles and cups back in 2012 over some troubling studies. Your baby doesn’t need some diamond crusted, golden handled spoon to eat from and they don’t need to cost like they are, either. Price is an important factor when making just about any decision these days, including what spoons you buy. Remember, you’re about to be feeding a baby. They’ve got the attention span of a goldfish and they’re incredibly stubborn, it’s not a recipe for an easy meal-time. Colorful utensils can make the entire experience go much easier than if you go with something drab. These silicone spoons come with a very easy-to-notice label stating they’re BPA free, so there’s one thing down on our checklist. They’re so soft they even take the shape of your baby’s mouth, making a much more comfortable meal-time. If you’re constantly worried about food temperature these spoons will even change color if there’s too much heat, letting you know you’ll need to let it cool a bit first. 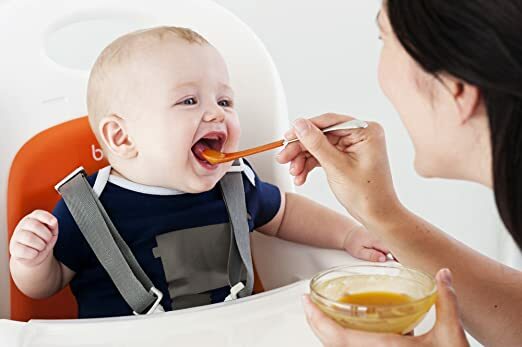 Lastly, the ergonomic design is fit for use by both parent and child, so you can more easily teach them to feed themselves. The Swap is an incredibly designed utensil comes with two different sides: a soft side and a hard side. This little piece of human ingenuity allows your child to tell you which it is they prefer to use! 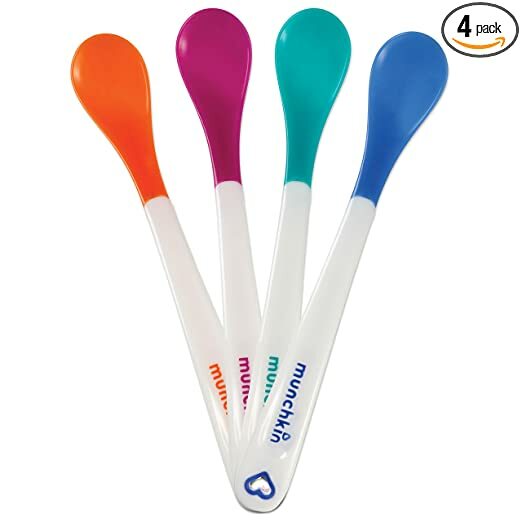 These spoons are dishwasher safe, BPA and PVC free, meaning you can rest assured about the state of your child’s health. The flat tip also means it’s perfect for first timers, so you learn with your child starting right off the bat. If you ever wanted to make eating a fun, exhilarating experience for your child then the perfect spoon to take a look at. Shaped like a curled leaf,the fun design has proven to quickly become a baby favorite, even turning into a play-time toy for the table! 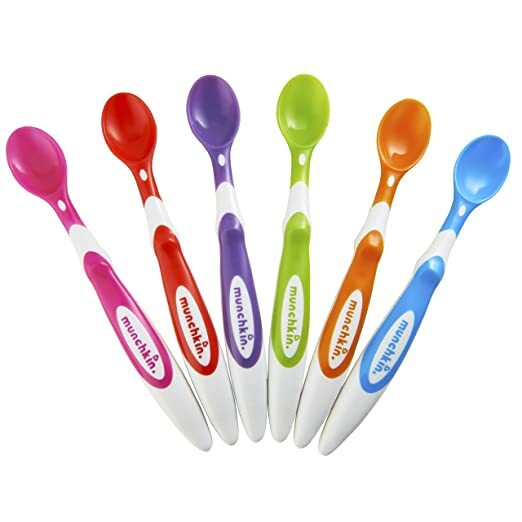 These spoons are made of 100% food-grade silicone, meaning you can worry a bit less about bruising on your baby’s gums. When your baby starts to really get into feeding themselves you’ll also notice the odd design helps them learn better. The spoons from Munchkin’s soft-tip set are brightly colored and soft enough to ensure there’s no hassle when the high-chair comes out. Each spoon is the perfect length to reach the bottom of a food jar, and each set comes with six different spoons, giving you a bit of variety. The deep tips are better suited for the later transition to solid foodsrather than just starting asthey can be too deep for a younger baby, but when they’re ready to take that step up these make an excellent addition to any silverware drawer. Is your child’s food too hot? Do you know how to tell? Well, with the Munchkin White Hot set you’ll never have to worry about that again because the spoons change color to let you know. You can place them in the dishwasher without having to worry about anything melting, so cleanup is a breeze on top of the “easy” meals. Easy in quotation because the spoon shape makes less dribble, but the rest is on you! A good parent always strives to be conscious about their child’s needs, but until they’re old enough to tell you what that is you’re stuck figuring it out. Do they like the softer material or the more rigid? Do they seem disinterested in meals? Finding the best spoon for your baby doesn’t have to be a struggle, you just need to follow the simple tricks outlined in this guide to find the perfect spoon for you and your baby.